Liberty Lift is a customer-focused oil and gas lifting leader, with efficient, cost-effective solutions and iron for any extraction operation. Our senior leadership brings together more than 125 years of experience in pumping units, including design, engineering, manufacturing, and application of pumping product lines. That experience allows Liberty Lift to rapidly expand on its own product line and ensure that it can provide a solution to any client in major U.S. drilling regions. We have the Permian Basin well covered with our Goldsmith and Midland locations, providing customers with the best service possible. Liberty Lift is a designer and manufacturer of industry-leading oil and natural gas lifting solutions. Our pumping units take the best of classic, proven systems, and the newest technologies the industry has to offer. The result is a reliable, efficient piece of iron that can be tailored to any well, regardless of its depth or flow rate. Liberty Lift knows that oil and natural gas extraction operations never stop, so it backs all of its equipment with a support team that also never stops. In Liberty Lift, oil & gas companies have a forward-thinking technology partner in the well lifting segment. Optimizing oil and natural gas extraction is what every rig operator aims for, and that’s what Liberty Lift aims for too. Our artificial lift systems make such optimization possible, and possible in every extraction application, no matter what kind of well is present, how deep it is or at what elevation the well is located. Liberty Lift can provide its clients with a well stimulation product for every application because we offer a diverse range of technologies. In addition to gas lift systems, beam pumping units and hydraulic jet pumping units, Liberty Lift’s engineers have also designed and drawn up its XL Long Stroke product, which offers fewer cycles and prevents gas locking. It’s just one example of our commitment to the oil & gas industry, and the operators who make it possible. All of Liberty Lift’s iron beats API 11E specifications and is field proven. Our meticulous design and manufacturing processes are intended to adapt with the oil & gas industry, which is why Liberty Lift is a primary technology and oilfield services partner for companies in the field. With more than a century’s worth of experience in the industry, Liberty Lift knows how to design and manufacture top flight artificial lift systems. Our comprehensive array of pumping units can generate optimal pressure in any well, so they fit our clients’ needs to the letter. They fit API’s standards as well and are worthy of the monogram. And when our iron does need service, Liberty Lift’s support team can get anywhere in major U.S. drilling regions, any time of the day or night. Oil and natural gas pumping units need plenty of ongoing maintenance to ensure their continued production, which is why Liberty Lift staffs some of the best support technicians in the industry. As any well operator knows, pumping units face punishing work, with little downtime to mitigate the wear and tear. Eventually, even the best built pumping units are going to need care, and fortunately, our service team is available at all times to provide just that. Liberty Lift can manage service projects at one of our facilities or deploy our support personnel in the field to help clients optimize their lift operations onsite. In the field, Liberty Lift can inspect its pumping units and perform preventative maintenance in order to avoid major technical faults. And with a stroke change here or a rod string adjustment there, our support team can optimize the unit, getting the last bit of production out of every well lift application. Without a reputable support team, every hiccup is potentially catastrophic. Liberty Lift works hard to avoid such scenarios. Artificial lift technology is an essential part of every oil and natural gas well operation, and its proper application is critical to optimizing production. Liberty Lift makes this dynamic its mission, with the goal to design, engineer and manufacture the best artificial lift systems the industry can provide. Our product mix reflects this not only in its quality, but in its versatility, as we produce several major artificial lift technologies. They include beam pumping units, hydraulic jet pump units, gas lift systems and our XL Long Stroke unit. With their rugged iron and smart design, Liberty Lift’s pumping systems leave no drop of oil or gas behind. Beam pumping units must provide an unbeatable combination of efficiency and reliability, and Liberty Lift’s technologies tick those boxes. Our beam pumping units are designed to exceed API 11E engineering and API quality standards. They are also designed for rapid installation and with interchangeable components, so Liberty Lift can provide responsive support when new components or maintenance is needed. Liberty Lift’s technological prowess comes through clearly with its beam pumping technology. Our engineers have designed a pair of beam pumping systems, including a High Efficiency and an Enhanced Geometry model. The High Efficiency model is a rugged, reliable piece of artificial lift technology that can serve as a central piece of a well’s extraction operations. The Enhanced Geometry model comes with extended crank rotation, allowing for better efficiency, more upstroke and less downstrike time. 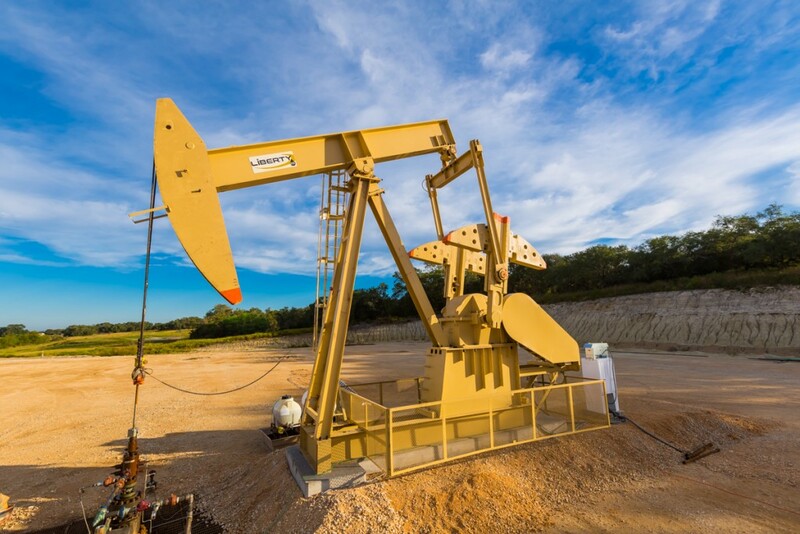 In short, both of Liberty Lift’s beam pumping units are appropriate in most oil & gas extraction projects, and can be expected to perform throughout the well’s life cycle. Among Liberty Lift’s artificial lift solutions are its gas lift systems. Artificial gas lift systems are naturally adept for some of the most challenging wells in existence, and because they can be configured with wireline retrievable equipment, they are easy to maintain. Their strong combination of efficiency, flexibility and ease of use have made Liberty Lift’s gas lift systems some of the most cost effective artificial lift technologies in the industry. Our gas lift systems can handle very high solid content in flow, and our patent-pending technology, built into all of our gas lift systems, allows for faster removal of solids and flowback fluids. Every Liberty Lift features the necessary valves and mandrels, the latter of which meets API 19G1 standards. They are available with tubing retrieval or side-pocket configurations, and can be built with a round or oval body design. And like with all of our pumping units, Liberty Lift maintains an impressive support team, and several facilities for for repair or component replacement. In all, it’s little risk for a lot of gain. Liberty Lift has always been on the leading edge regarding oil and natural gas lift technology, and the XL Long Stroke is the latest example of that. The XL Long Stroke offers a 306-inch stroke length and is built to beat API specifications, with additions like ductile iron gears, tempered alloy steel pinions and oversized anti-friction bearings. At its heart, though, the XL Long Stroke is about improving the pump’s performance, with slower cycling that encourages better fillage and protects the rod string and bottomhole components at the same time. Liberty Lift has developed the XL Long Stroke from the ground up, as our engineers have designed it, our facilities have manufactured it and our support professionals maintain it. This provides our clients with unbeatable value, as we can fabricate and deliver components with rapid turnarounds, and install them in the field. If more involved service is required, Liberty Lift has facilities located throughout U.S. drilling regions, so we are never far away from our clients’ wells. Liberty Lift’s artificial lift systems are in operation all over the U.S., and a major reason why they remain in operation is our support capabilities. Although Liberty Lift designs and manufactures a range of lift equipment, our talented technical crew fabricates and maintains more than that, including mandrels and valves. We also partner with other companies in certain instances to provide the best possible lift solutions, where engineering and building in tandem results in even greater efficiency and build quality. Such is the case with our hydraulic jet pump. Liberty Lift and JJ Tech have partnered together to create the industry-leading hydraulic jet lift system, taking a great technology and making it even safer and more efficient. The Liberty Lift and JJ Tech system combines a surface unit, developed by Wanner Engineering, and a subsurface pump produced by JJ Tech. The surface unit is skid mounted and can be installed in one of several layouts. It consists of a seal-less diaphragm positive displacement pump that keeps downtime and maintenance to a minimum. It is an ideal choice for frac operations, as it is built to manage huge volumes of returning fluid. JJ Tech’s downhole pump is made without moving parts and can be operated normally or with reverse flow, depending on the well’s condition. It is easy to retrieve, and can be removed using a hydraulic or wireline option. JJ Tech’s pump also comes with proprietary software for monitoring performance and optimizing it in response to the well’s status. The Liberty Lift and JJ Tech hydraulic jet lift system is ready for purchase or for rental, and is ready to facilitate any extraction operation.